[miningmx.com] – ARCELORMITTAL South Africa (AMSA) said it had “a reasonable prospect” of returning to profitability after one of the measures required for its recovery – duties on cheap imports – was partly supported by the government. The beleaguered steel manufacturer said in an announcement today the South African government had agreed to further custom duties of up to 10% on cheap imported wire rod and rebar, effective from December 18. This brings to three the number of applications brought against cheap imports out of a total of 10 applications submitted by AMSA to the Department of Trade & Industry. The final decision on the remaining applications was expected early this year. Applications for duties to be brought against imported hot and cold rolled coil and cold rolled plate had also been submitted in December. Engagements with the government were “advanced and ongoing”, it said. In conjunction with cost saving measures and a R4.5bn recapitalisation AMSA’s board remained “… of the view that these interventions have a reasonable prospect of returning the company to profitability in the medium term,” it said in a statement. 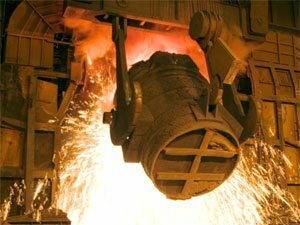 AMSA said that without tariffs, South Africa’s steel industry – and the company – “… will need to undertake significant structural change”. The custom duties have come too late for AMSA’s Vereeniging Works, however, following a review of the historic mill’s long-steel business which will result in the loss of 400 jobs, the group said in August. Vereeniging, founded in 1911, would be merged with AMSA’s Newcastle business while it had also extended its business review to its Vanderbijlpark Works. Then in December AMSA unveiled a slew of business saving activities including liquidation of excessive stocks, matching production to demand, the sale of redundant assets and funding from Luxembourg-based parent, ArcelorMittal Group. Some R1.3bn was also expected from the parent by about January 25 as part of its agreement to fully underwrite AMSA’s R4.5bn rights offer announced last year. ArcelorMittal would also extend short-term debt after facilities were renegotiated with commercial lenders, said AMSA. “Shareholders are reminded that the company still faces challenges and future profitability is highly dependent on the above initiatives being successfully concluded,” said AMSA.